If such a thread already exists, I'm sorry, you may delete/close this one and/or move it. A few small rules before you post! 1.Please state if your character is from an AU or canon universe, this would be especially useful if they are like a Lime blood or something. You don't have to go into massive detail about your AU, just information you deem relevant. 2. Fan Carapicans or Leprechauns are also allowed. 3. Other people are welcome to critic, but don't give joke critic on non-joke characters or visa versa. 4. There is no set amount of information you have to place, but if you don't give much information, there is not much advice you can give. 5. You can post your joke characters here but don't expect a serious critic back! 6. I will reply in red, anybody else can reply in anything that they want to, so long as it's clear in distinguishing the original from the critic. Without further ado! Onto the Reviews! Here are some Mary-sue tests for Homestuck that I have personally made, they might be useful to you. Symbol/Shirt Decal: Her shirt is black with yellow stripes, her symbol is a white circle with black stripes depicting a stylized bee. Typing Quirk/Style: Replaces "bi"-sounding syllables with "bee". Since it's based on a sounding then "to be" becomes "to bee," "inbetween" becomes "inbeetwen," "building" becomes "beelding" but "bench" stays the same. Also replaces "z" sound with "zzz". Therefore "please" becomes "pleazzze," "it is" becomes "it izzz" but "it's" stays the same. She also frequently uses malapropisms or just mispronounces words (e.g., "in the deed" instead of "indeed" or "quadriceps" instead of "quadrants"). And she does like big-sounding words usually shoehorning such words as "bethroned," "belabour" and "bestow". In other words she is bee-themed troll who likes her buzzwords. Not to mention all the malapropisms make her a Misspelling Bee. Story/Background and Personality: her hive is on The Swarm Meadow (hardly a threatening name, I know), which she shares with the bees and her lusus. Considers bees as her siblings but rarely had a contact with other trolls because Swarm Mother is a very territorial creature who doesn't want "outsiders" on her meadow. Being raised with bees resulted also in the fact that a proper language is kinda alien concept to her (this is where her malapropisms come from). After all, an animal can understand such concepts as hunger, warmth and happiness but will struggle with such concepts as doom, revenge and concept itself. Her lusus fortunately ordered some bees to find Honera some books to read, therefore Honera likes Alternian hystorical recordings. From these books Honera learned about hemospectrum which makes her somewhat bitter because she understands that her place is kinda low. She dislikes hihgbloods for being racist jerks but she does envy them for being so high on the hemospectrum (despite frequently saying that hemospectrum doesn't matter). What about powers her lusus has? She has somewhat different powers. She can talk to bees and maybe ask them but definitely no command/control (no putting bees to slepp like Sollux and even asking won't be easy. Ask a bee to spy on a certain troll wearing blue pants and red shoes perhaps? Telling bees to seek others by appearance is hardly a step-up from telling a human to locate someone by scent. Not to mention bees have busy daily routines instead of running errands for their "sister"). So despite the fact she calls her self "a drillmaster of bees" [see also: strife specibus for a silly pun] she is hardly one. Of course should she get attacked with bees nearby they are likely to help. Oh and no levitation like her lusus either. Also when her blood gets spilled it is likely to alert nearby bees and make them attack the "marked one" but she doesn't know she has this power. Not to mention even if she learns she's not going to start involuntarily stab herself to squirt her blood left, right and centre. Of course her powers are hardly useful without bees around but no, she is not captchaloguing bees. I mean, showing your siblings inside a pocket is just plain mean. 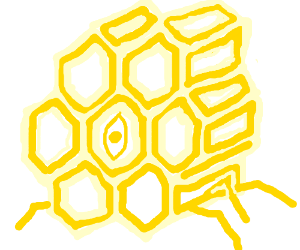 Thing is, she is jealous of her lusus because while Swarm Mother can command bees, levitate and place Mark Of The Swarm Honera cannot do so. Otherwise she is quite friendly albeit prejudiced against the highbloods. She is also too confident in her vocabular, bordering on being in denial. But she doesn't overestimate her hemospectrum position. Title: Sylph Of Rage. First, aspect. Rage here refers (fanonically) to a failure, negative emotions and predetermination. Predetermination refers to swarm structure she's been raised in and her hemospectrum position. Negative emotion would be her envy of her lusus and the higher-bloods (also predetermination again). Failure is represented mainly by what she is doing to English language. Now, class. Sylph is a healer. So I guess that makes her able to keep her allies' negative emotions from overriding them. First she will need to deal with her own jealousy, however. Also the fact that her God Tier outfit has a purple colour palette might make her happy. After all, Alternian bees have a similar colouration. Land: Land Of Meadows And Buzzings Or anything else? Dreamself: Derse, mainly because of her aspect. If you think her SBURB information doesn't fit her and want to suggest something else please do. The main themes of this character (i.e., the ones I don't want to change) are that she is bee-themed, uses malapropisms and will have to learn to find her own way in life instead of trying to become a copy of her lusus. Everything else can be changed. 1. Just by skimming over I am seeing bees,bees,bees. Its kinda of like opening a jar of bees on someone, its a little too much. You can keep the bee thing going on, just not so prominent. 2. Ok now that I actually read it...you have opened the jar of bees on me. Like I said above, too many bees, way too many. It seems like the character revolves around the idea of bees and nothing else, its very one sided in that way. They must be something else to make it less "bees" and more "free of bees". Of course you can keep the name, you may want to change the shape of the horns a little. Blood, age, all that is fine. Clothing, not fine, straight up bee, no thank you. You can have yellow and black in her outfit, no bee stripes that just kills it. Again, sorry if I sound mean. Oooh, this name seems well thought out and rather creative! Good on you! The colour is fine, but she's not in danger of being culled if it's any brighter, so you can probably go brighter if you want to. Note that typing and blood colour doesn't always have to match perfectly. So long as you aren't a Jade blood typing in Orange. So, nothing else, just a bee? Normally symbols have some kind of meaning to them, or at least aren't straight forward. But I suppose it's alright. Okay, that's honestly some lovely art and a great idea! Well done! (Plus, you clearly have done some research). Hive? It's kind of cliche but it might work, and it's the only thing I have for now? Most Trolltags generally have longer sounding words anyway, but the tag flows well and sounds nice. All those puns! Wonderful! It's nice to see you took a lot of time to pick a quirk and make it specific as well as making it very unique to your character (as well as probably amusing to read). Generally speaking there is not much wrong with this, but I do find it a bit odd that she found out about the hemospectrum so late, it's generally one of the most important parts of troll society, even if she was isolated. Again not really 'wrong' just a bit odd. Also, she's been isolated for so long, how can she be friendly or is she just kind of 'excited' to meet new people, even though she's awful at socialization. I also like how you kept from being too overpowered. Land of Emerald and Voice? Perhaps you can think of better. As for class, her problem seems to be more and Active (-) personal quest rather than one that is also down to her and other people or Passive (+). Perhaps Maid of Heart or Maid of Rage. Since she had always been reliant on her bees to tell her what her place in the world is, and never really worked it out for herself in the outside world. 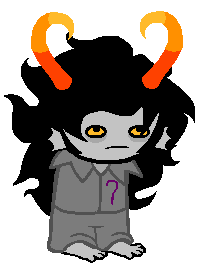 I think this fantroll is a pretty good one! The name and quirk are well thought out and creative, the backstory is unique without being too 'in your face'. Although I've seen plenty of 'bee' fantrolls this is one of the best I have seen. That being said, it doesn't 'blow me away' it's great but not amazing, it doesn't really intrigue me, but that's fine. Perhaps it just needs a bit more characterization or personality, or hobbies to 'spice' them up a bit. Although I wouldn't go as far to say they are 'boring'. I have no real problems with it, it's a solid character, feel free to change the SBURB information if you feel some of mine (or your own) suggestions fit better. Good luck roleplaying this character (if you plan to) it seems like it'll be fun! Okayyy here I go, time to present my fancestor (whose descendant isn't completely designed yet, but I'll put her here too eventually). hatchname derived from the Chichewa word (according to Google Translate) for "seating, culture, conduct"
Title: currently undecided what she starts out with, but it's something very simple and career-based. Takes "the Conterit" at 28, and is later given the title "the Meliorate" sort of unofficially by someone she meets through the Revolution. I headcanon that this sort of thing would happen a lot in Alternian ancestor times - think about, like, how some names function in the Bible. Age: 9 sweeps old at the technical beginning of her story; 28 when we meet her. Blood Caste: the color of this text, #803300. Below the Nitrams, but still considered umber. Lusus: Hadn't put much thought into this until seeing this thread, to be honest. I'm not really sure. In the story I've started for her (and her eventual companions, whom I'm still designing), I say something about her lusus hunting, but that's pretty much it. Strife Specibus: I swear I at some point had something for this. Potentially a chakram because I just like those too much, and because the yin-yang shape kind of suits her. Appearance: Oof, it's been too long since I touched this character, let's see what I've got. Body type: broad shoulders, rectangular silhouette, flattish-chested... generally, broad shouldered but thin for her body type. Very-slightly-tall, you could say? Hair: a little under shoulder length, thin, a little choppy and uneven. The closest comparison I've got is like Araneas but not as thick? I should really draw a ref soon. She wears her hair down. Long-sleeved shirt bearing her sign, long pants with a lot of pockets, plain leather sandals. Plot: Iscari grew up in a very communal neighborhood, shared by mostly those of her caste. It was self-sustaining, everyone working in the fields together, lusii hunting to help sustain their charges and the community, a very "it takes a village" childhood. She's not terribly close with anyone, but not not close either, sort of like staying with extended family. Her work is to plant the root vegetables and then grow the root vegetables and then harvest the root vegetables, and so she does because that is the ultimate good she can do. You were nine sweeps old, weak and afraid, when drones burned your lawnringmate’s hive to the ground for her silence. When they threatened to burn yours, when they asked if you’d seen a ‘Signless,' or had a tip to his whereabouts. You didn’t know any Signless, but they wanted a ‘yes,’ and so you told them of the strange man from the night before. Of the ideas that had so scared you then, of the treachery you were sure he was capable of if he managed to get any power behind him. You painted him a criminal, a man you wanted out of your life because so far as you were concerned, your sweet, loyal little town didn’t need that kind of upheaval. You told them where he’d come from and where he’d gone, and they let you and your lusus leave safely before searching your home. Nights later, but not many, you heard of an execution. In any case, as she grows up she begins to understand exactly what she did. No one else knows it was her, in fact she keeps everyone at a polite sort of distance, but it does affect her. She keeps beating around the bush about actually doing anything about it (I can't leave yet, my lusus is old and needs someone to provide for him; I can't leave yet, this dark season's seen a meager harvest; I can't leave yet, I haven't cut ties properly...), until finally realizing that she just needs to do something about it, and so at age 28 she leaves, not entirely sure where she's going or what she's going to do once she's there. Leaves her old name and becomes instead the Conterit, searching for some act of penance. That search leads her sort of stumbling into the Revolution. Once there she becomes sort of a counterpoint to the Summoner's haste and fiery attitude, and that I-need-to-be-a-good-citizen loyalty becomes emotional loyalty as she actually starts to make close friends. Personality in a nutshell: modest, interested in a quiet life, concerned with diligently working for what's "right." That motivation doesn't change; but her conception of what's "right" does. She sees her actions as what she needs to do: when she stays home it's not in her own interest, when she joins the Summoner's rebellion it's not a heroic decision to do what's right, to her it's all simply what needs to be done. Part of her arc involves learning to see past that to a more emotional approach, but it never really leaves. (pre-Scratch) classpect ideas: Maid of Blood, Prince(ss?) of Doom, Sylph of Doom... I don't know, none of these seem quite right. Typing quirk: nothing yet. Which is a bit of a problem, considering Mindfang is proof that ancestors do in fact have typing quirks, or at least "writing quirks" in her case. She may not have enough of a theme. She's designed more around her story than around some concrete theme, though I've slipped in some elements of yin-yang (her weapon, the shape of her horns, potentially something about her lusus). Her sign is closely tied with Libra, so that feels fitting. She may be too singularly themed around her plot - which is partially the point, at first her life was entirely about her place and now she's basically stopped and made her entire life about this sort of penance. Her single-mindedness is among her major flaws, but it's still... eh, worrisome, enough so that I thought I'd throw that out there. I will take a moment to acknowledge that most ancestors seem to be themed around their story, plus just a touch of their descendant's theme, so there's always that. She might not be Homestuck-ish enough; not sure how else to put that. Just a note - I'd never tried to find the hexcode for her caste before, and this doesn't feel right at all. In writing it's described as "a color matching the clay-rich soil beneath your feet, and it’s a miracle you’re not quite burgundy." "Conterit" was originally an allusion to "contrition" but is also evidently Latin for "he/she/it breaks," which.... could work or not?? It's past midnight here, so I'll do this when I wake up tomorrow, it that alright? oh that's fine! of course, take your time, and thank you for offering your help at all! It's a pretty good name! Lots of revolution fantrolls I see, but that's not bad. I like the names. Oddly enough, asteroid fantrolls are rare, despite constellation fantrolls being so common. I like how you worked it around her backstory as well. Hmmm, the only thing I can think of is that her symbol kind of looks like an anchor but upside down, this would suggest some kind of water lusus but she's a low blood so no. Perhaps a dog because they are known universally as a companion of all people? I'm not quite sure what that is, but I've never seen it used before, so if it fits it's probably a good idea! Not too fancy for someone of her blood colour, so she's fine. Plot: Iscari grew up in a very communal neighborhood, shared by mostly those of her caste. It was self-sustaining, everyone working in the fields together, lusii hunting to help sustain their charges and the community, a very "it takes a village" childhood. Seems a tiny bit unusual for trolls, perhaps there would just be less of that sort of thing for them? But it's not a bad idea. She's not terribly close with anyone, but not not close either, sort of like staying with extended family. Her work is to plant the root vegetables and then grow the root vegetables and then harvest the root vegetables, and so she does because that is the ultimate good she can do. You can write an OC centred fic, so long as it doesn't revolve around Jamzee Makara as Karkat's girlfriend. In other words, it does something different. You aren't going to involve her and the Signless too much are you? If you do insist on keeping him in the story, keep him to being a background or secondary character. Okay, I like the fact that you took a different side to the Signless, than his traditional interpretation. It puts a nice spin on normal Oc/Canon interactions without character derailment. The OC shows a more unique personality in this. I can't help but feel that change happend a little quickly, how else did she change her attitude? Hmmm, alright again, I'm not sure if you need to involve the Summoner, although your were creative in the way that you did it. She seems to have a rather simple motivation, this might make a bit of a cliche hero just doing 'right' because it is 'right'. The rest of her personality is nice however. I think Maid of Blood could fit almost perfectly! Maid of Doom could also work. Hmmm, perhaps try and base it off the symbol? I mention again being 'dog' like? So probably something to do with that? Perhaps she might put 'woof' or 'bark' in her sentences? Although I'm not sure how much it fits. Her life seems to change somewhat quickly, perhaps show how her flaws can also damage her? Perhaps her single-minded morality could also be a flaw of hers? I think that's alright. She's Homestuck-ish enough. Although you have just started with the theme, I do like it. The name and symbol you picked are some of the things that I like most. The story is decent, but her mind seems to change fairly quickly, plus I'm not sure having the Signless in the story was really needed, even though he was kept to the background he can easily be replaced. Canon should only be in a story if it's really absolutely necessary. Yes, I agree you should develop the theme a bit more, perhaps look around humanism or collectivism and symbols of those for other ideas o how to develop it. Her personality could also go for a tiny bit more development. Overall, I do appreciate the uniqueness of her, and I think she could go a long way with a little more development. Inspirtations: Miles Vorkosigan (Vorkosigan Saga), Sand dan Glokta (First Law Trilogy), Reinhart von Lohengramm and Paul von Oberstein (Legend of Galactic Heroes). Tropes "Heroic Sociopath" and "Weak but Skilled"
Name Meaning: had one, unfortunately neither for them, nor for their ancestor I saved any notes I had, therefore the meaning of the name is lost. Decided not to change, still sounds quite nice. Gender: Agender. Do not concern themself with this issue. Lusus: Jellyfish mom - a giant, hovering, jellyfish-like creature with a myriad of tiny hands attached to the ends of it's tendrils. They care for Ollima a lot and usually the main means of transportation for the troll through the water, since the seadweller is not very capable of doing it by themselves. Age: Depends on the setting. By default - 8 sweeps old. Appearance: First thing that will become evident upon seeing Ollima is in how bad of a physical shape they are. A pale, frail, even gaunt figure with vicious looking bags under their eyes. No amount of hiding will ever conceal the fact they are really, really sick. They are quite tall with their hair being overgrown and, when they are out of the water - quite puffy and messy. Their face almost never shows any kind of emotion and their eyes are the ones of a fish - dead and unnervingly calm, cold and without compasion. Their horns are shaped after their sign and a whole foot long each, making the troll with horns included to be around 6'6"
Usually down the line they might start using a wheelchair to move, especially if they abandon their lusus or it dies. Personality: Despite being frail physically, Ollima is anything but that. The will, both to not die and to achieve whatever the goals they set for themselves is burning like a flame inside of them. One word that would probably describe this troll in the fullest would be pragmatic. They tend to be pragmatic almost about everything - hemospectrum, other trolls, ideologies, everything is just the means to achieve something for them. Detatched and unable to feel empathy almost at all. Hates the ambitious trolls, since ambition is usually leads to the ruination, for the ambitious always desire more and more, even when it becomes unreasonable. Careful, methodical, they treat any unknown entity, any troll that still is a variable to be calculated as a highest possible threat, and remove the threats accordingly. While killing someone is not something they have any qualms about, removing someone permanently is definetely the last resort when there is no way to remove the threat without any such action. Not the one to gloat or cackle. Doesn't have a lot of hobbies, but prefers to read about daring young starfleet commanders and historical drama during any possible free time. Doesn't like chess, nor any kind of troll equivalent of it. Ancestor: Archduke Mudgrave, also known as The Betrayer - a vile pretender and usurper of Alternian throne, who tried in a time long past to go against the will of the Empress and stab her in the back, while she was away, conquering the insubordiant races. Mudgrave was ambitious and ferotious, yet short-sighted and his feeble attmept ended before it could ever begin. Betrayed by his own followers, afraid of the Empresses wrath, he met a fitting end and was buried in a shallow grave filled with mud. He was stripped of his actual title and given this, mocking one, after his demise. Ollima despises their ancestor, seeing him as a cautionary tale about wrong people having the power and how ambition leads to ruination. Classpect: Seer of Time - seers are analitycal and usually have self-destructive tendencies and concerned about undertaking a path leading to a specific goal. Their path is about sacrifice, especially sacrifice tied to their aspect. With Ollima having not much time due to their declining health it is a fitting one. Land of: Ticks and Pillows. First part is a pun on the sound the clocks make and ticks as in bugs. Pillows are about comfort and rest, something that Ollima doesn't want to have, always trying to do something, enact plans, get to the goals. Besides, pillows remind them of their own frailty. I don't know the characters here, but I do know the tropes you are using for this! Let's how much I can spot them! Ah, alright the name seems alright anyway, I won't bug you since you probably have a meaning somewhere. I like how you tied this one carefully into their personality as well as how you made it a method of transportation as well. It also helps characterize your troll, riding a venomous jellyfish shows them to be dangerous despite being weak. I always would I have thought that symbol would be better suited to a lowblood, it would sort of suggest he would be a farmer of some sort, but also a leader. But perhaps it's just me, I'll see how you use the symbol. Appearance: First thing that will become evident upon seeing Ollima is in how bad of a physical shape they are. A pale, frail, even gaunt figure with vicious looking bags under their eyes. No amount of hiding will ever conceal the fact they are really, really sick. I feel like other trolls are likely to judge them quite a bit for being 'sick' espeically as a sea dweller, does he ever feel this pressure? They are quite tall with their hair being overgrown and, when they are out of the water - quite puffy and messy. Their face almost never shows any kind of emotion and their eyes are the ones of a fish - dead and unnervingly calm, cold and without compasion. Their horns are shaped after their sign and a whole foot long each, making the troll with horns included to be around 6'6"
I think this fits well. Kind of odd for a seadweller, but there is also nothing wrong with it. Personality: Despite being frail physically, Ollima is anything but that. The will, both to not die and to achieve whatever the goals they set for themselves is burning like a flame inside of them. One word that would probably describe this troll in the fullest would be pragmatic. They tend to be pragmatic almost about everything - hemospectrum, other trolls, ideologies, everything is just the means to achieve something for them. Detatched and unable to feel empathy almost at all. Hates the ambitious trolls, since ambition is usually leads to the ruination, for the ambitious always desire more and more, even when it becomes unreasonable. I like this idea as well, still plays with highblood strengths and weaknesses, but in a more unique way. Despises the quadrants, placing them in the same category as bigotry and prejudice, considering a mental weakness. That's a bit extreme, considering they are almost necessary in adulthood for trolls. Plus, although you mentioned that they were pragmatic, this doesn't seem very pragmatic. I like the idea he is afraid of attachment, even though his extreme hatred is a bit much, there is justification for it. Both are good, and flow well. Hint, if you want a similar tag to 'preemptiveEscalation' that fits the GCAT rule go with 'avertingAcceleration' possibly? Depends which you like better. I think this quirk fits well! Ancestor: Archduke Mudgrave, also known as The Betrayer - a vile pretender and usurper of Alternian throne, who tried in a time long past to go against the will of the Empress and stab her in the back, while she was away, conquering the insubordiant races. That's a pretty dramatic sounding backstory! Mudgrave was ambitious and ferotious, yet short-sighted and his feeble attmept ended before it could ever begin. Betrayed by his own followers, afraid of the Empresses wrath, he met a fitting end and was buried in a shallow grave filled with mud. He was stripped of his actual title and given this, mocking one, after his demise. Okay, that's a nice spin on the story, nice to see characters fail because they succeed too often! Again, something quite different for trolls but it works. Interesting,although Seers find themselves first having trouble coping with the nature of their aspect, I think Seer of Life and Seer of Rage could also work for this character. I like this, both challenges them and helps them conquer their own challenges and faults. This is a pretty unique troll, Although I feel they are in danger of becoming slightly overpowered despite their weakness; I think that they way you have used their personality and made them more unique has actually worked. The backstory is nice and their personality seems well placed into the rest of their information. I still don't understand why you choose the symbol you picked, it doesn't really match them, as it doesn't seem a proud or kind leader type as would really suite the theme of the troll or be cooperated into his personality. That's my only real complaint. Again, this a good unique troll, not sure how suited to roleplay they are , but they will probably pretty interesting to play.